Link To My Blog Google Gadget. ~ The Blog Doctor. You are here: Home > Increase Traffic > Link To My Blog Google Gadget. Link To My Blog Google Gadget. A reader requested me to convert the "Link to My Blog" Blogger Widget into a Google Gadget. You can create a similar Google Gadget for your blog and release it into the Google Gadget directory. We have already seen before how to create Google Gadgets. We will be using the same method here. 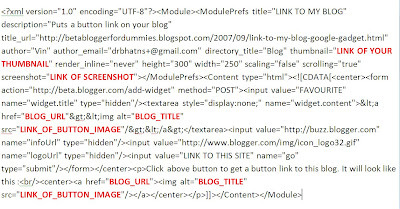 Replace the code in red with your blog link (BLOG_URL), the link to the snapshot of your Gadget (LINK_OF_SCREENSHOT), the link to the thumbnail (LINK_OF_YOUR_THUMBNAIL), Blog Title (BLOG_TITLE) and link of your button image (LINK_OF_BUTTON_IMAGE). Click the 'LINK TO THIS SITE' button at top to test the gadget. The Add Page Element page will open inside the gadget. You will have to scroll to select the options to add the image/button link to your blog. Click the +Google button in the bottom frame to add this gadget to your personalized Google Homepage (iGoogle). Excuse me, where can I find "add bookmark" icons like yours? I'd like to add a Blogger and Wikipedia icons too, but I have no idea about where finding such things. Thank you very much! Thank you very much for your kind answer. I already read your useful explanation, but what I'd like to know is where I can find more icons. I mean, who makes those icons? Can I re-use them or are they protected by copyright? Should I create them by myself? I have no idea on how I can make an icon which is the same of the logo of sites like Blogger, etc. Thank you again. I'm very sorry to bother you again, but I think it would very nice to insert an imagine in my post in place of the default "e-mail this post to a friend" icon, as you did. I tried, but, even if I can write the blog ID because it doesn't change, I don't know what doing regarding the post ID. I tried to find the answer in your blog (for example, in the posts section), but I couldn't. Really sorry and thanks a lot! You can make icons online in icon generator pages. Just Google for "icon generator". On your PC you can use graphic editing programs to make them. Try Irfanview which is free. Again Google for it. Vin, I REALLY NEED YOU HELP! I've customized my blog but I am having trouble with the spacing of my text in my middle section. Can you help me??? Your blog is not for mere seeing for me. I have to understand a lot from it. I think this is true of many novices like me. I congratulate you. hey vin yeah tried what u said but change html code to what u said, saved it, says changes to html taken but then changes them back to what was?